A moose with a fibromas tumor may look to be in terrible condition, but really these tumors don't affect the health of a moose. The following picture submitted by Ken, and he asks this question. This cow moose has had many sores on it's body for the past two years. Yet, she appears to be very healthy and has had a calf both years. What are these sores and will they go away? This moose photo was taken in central British Columbia, exact location undisclosed. Your moose in question likely has benign fibromas, a wart like growth protruding from the skin. These are the most common tumor reported among moose. The fibromas can be smooth or shaped like a cauliflower and ranging in size from a few millimeters to over 100 millimeters. They can be hairy or bald in nature. They can be single or multiple and are also prone to hang from a slender stalk. The fibromas can become infected with bacteria if cut and look really gross, but they do the animal no harm. Eventually the sores will regress and disappear. They do not affect the meat and are removed if the hide is removed. 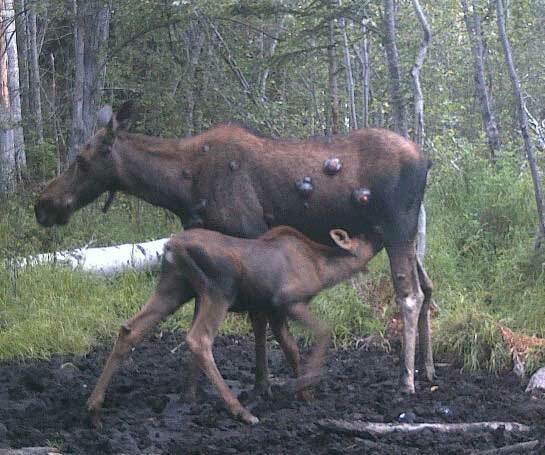 Your cow moose should continue to have healthy offspring. There are other types of tumors that grow internally in moose called "lymphosarcomas", they grow in the abdominal cavity. Large in size and shape like a cauliflower, a "myxoma" was seen in a calf moose in Ontario (Lankester and Bellhouse 1982). I observed a similar growth in the large intestine of a Holstein calf in 1986, the growth formed a complete blockage of the large intestine of the calf. We took the growth to the Abbotsford Agriculture Center but never did receive any feedback. Unfortunately I did not take any pictures. Deer Fibroma has been studied in quite some detail at the Michigan Department of Natural Resources. They state a fibroma is simply a wart, and are commonly found on members of the deer family. MDNR also state that the fibromas do not harm the meat, albeit a hunter who harvests an animal coveredin these growths may be put off. Like the moose in the photo, on deer the fibroma tumors are found near the neck and head and forlegs. They can also be found on other parts of the body. Moose on Isle Royal as well as here in British Columbia are reported to have these growths.